I work with earth to reinvent the relationship between humans and nature. Most living things make habitat for themselves, and we experience all of these habitats collectively as nature. What if we also made habitat that contributed by design to biodiversity–to the well-being of many other living things as well as to our own? I use structural earthen building techniques to engage with this question. The earth I work with is mineral subsoil that has enough clay in it to perform as a structural material. 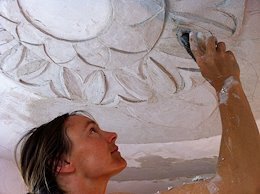 Inspired by traditional building techniques such as adobe, cob, wattle, butabu, and bahareque, I mix sand and different kinds of plant fibers into the clay soil to make it durable and weather-resistant. The clay in the soil holds the mix together and acts as a fiber preservative, so that the fibers retain their strength over time. I like structural earth as an artistic medium because of its deep and varied history with human buildings, and because of its evocative nature and technical benefits in the current ecological crisis (making buildings of earth requires about 1% of the energy of a brick or concrete building.) Earth is also a flexible aesthetic medium for communicating the pattern language of the wild. Practicing my art form spans the technical and the aesthetic, from designing and running structural testing programs to advance the use of low-tech earthen construction as a modern high-performance building material, to creating design tools for translating the loveliness of nature into the nuts and bolts of the human world. I work with earth because it has these two faces—the artistic and the practical—that each support the other, and are inseparable. Earth as a structural medium is labor intensive; thus my work depends upon community. For this I find that earth as a material has an accessibility like no other: clay soils are available most places in the world, half of the earth’s population currently lives in earthen structures, and people across the economic and cultural spectrum respond to the beauty of a well-built earthwork. I currently live in the San Francisco Bay area where I practice and teach. Current and recent collaborators include the Ecological Building Network, the University of San Francisco architecture and engineering programs, Lake County Redevelopment and Public Services, Swarthmore College, the Solar Living Institute, Marin Academy, and Berkeley High School Green Academy.